A little over a year after the last of those donations, Doyle appointed her to the Wisconsin Court of Appeals even though she had no prior judicial experience. Four months after the appointment, her husband Jeffrey donated an additional $250 to Doyle and then gave him a further $500 in 2009. Naturally, she claims that her massive Democratic donations stopped the second she was appointed to the bench, but that isn’t entirely true. She and her husband kept right on donating to Democrats. She just made sure her husband signed the checks. Jeffrey Neubauer is of course unbound by any obligation to be politically neutral and may donate to any candidate he wishes, but the $29,245 he has given to state candidates and $31,775 he has given to federal candidates since Lisa became a judge rather obviously came from her, too. 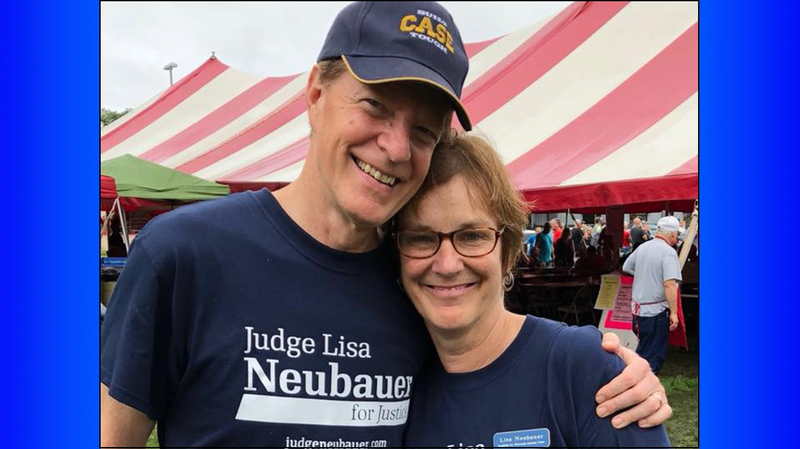 Think about it logically: The Neubauers are both lifelong Democrats who have given to the same candidates and committees right up until the moment that Lisa became a judge. At that point, all of the donations from the Neubauers were in Jeffrey’s name only. Did lifelong Democrat Lisa suddenly stop supporting Democrats? Of course not. She just couldn’t donate to them anymore without violating the Code of Judicial Conduct so she made sure her husband signed all of the checks. Through this loophole, Judge Neubauer has continued to be one of the larger Democratic donors in Wisconsin without ever raising questions about judicial misconduct. Is it possible that Jeffrey Neubauer made dozens of donations totaling more than $50,000 without his wife’s knowledge or prior consent? Sure, but as anyone who has ever been married will attest, it isn’t particularly likely. These are her donations just as much as they are his, and they present a significant conflict of interest in both her current role as Chief Justice of the Wisconsin Court of Appeals and the position on Wisconsin’s Supreme Court that she is currently seeking. On September 19th, Jeffrey Neubauer made a $5,000 donation to then-gubernatorial candidate Tony Evers. On November 5th, he donated another $5,000. How likely is it that he donated $10,000 in two months without telling his wife or without his wife agreeing to an expenditure that large in such a short period of time? It’s about as likely as either a Governor Tony Evers policy or Governor Tony Evers himself never ending up in a case before the Wisconsin Supreme Court. It is a virtual certainty that if elected to the Court, Lisa Neubauer will be tasked with deciding the constitutionality of an Evers policy and will hear cases to which Evers in his official capacity will be a party. How likely will it be that she will able to decide those cases impartially given her and her husband’s substantial financial support of a party before her? If the party is the State of Wisconsin, its lawyer very well may be Attorney General Josh Kaul. On June 4th, Jeffrey Neubauer donated $500 to his campaign. On October 21st, he donated another $1,000. These donations plainly demonstrate the extent of Judge Neubauer’s biases and indicate in the clearest possible terms how she will rule in any case involving Evers, Kaul, her daughter Greta (to whom her husband understandably donated $1,100) or the laws and policies they enact and support. Lisa Neubauer is a Democrat. About that there can be no question. There can be and should be, however, significant questions about her impartiality in any cases involving her fellow Democrats, especially those to whom she and her husband have donated more than $100,000. And there can and should be significant questions about the manner in which the Neubauers have been for a decade skirting Wisconsin’s Code of Judicial Conduct regarding political activity and potential conflicts of interest. This is especially pertinent given Judge Neubauer’s decade-long refusal to list on her mandatory ethics reporting form customers of her husband’s former business, Kranz, Inc. As a result, it is nearly impossible to determine whether she would have had a conflict of interest in literally hundreds of cases that have come before her; cases in which her and her husband’s financial interest could have been directly impacted. According to the Wisconsin Ethics Commission, a spouse’s clients only need to be reported if they provide more than $10,000 in revenue and are businesses (not individuals). If the spouse refuses to disclose that information, then the official is required to provide an affidavit. Her excuse? Listing her husband’s clients might help his competitors to poach them. In other words, her personal and financial interests trumped the interests of open, transparent government and ethical judicial behavior. Even though she is bound by the Code of Judicial conduct to list potential conflicts and recuse herself from cases involving those conflicts, Judge Neubauer refused because of its potential impact on her family’s income–income that she and her husband used to donate to Democrats in direct contravention of yet another ethical guideline. Lisa Neubauer is a Democrat, after all, and a rather brazen one at that.